I’ve been to a high number of Salesforce events over the past few years. Whether it’s the World Tour in New York or Dreamforce in San Francisco, one of the big takeaways from these events is the ability to connect with like-minded individuals. With Connections back in Chicago, we at Bubblebox are excited. There was a lot of disappointment last year when Salesforce decided to change the slated Connections for Chicago to a World Tour event. It prompted much response - predominantly from those who remember Connections from the days of ExactTarget (now marketing Cloud). The most memorable post I remember was from Eliot Harper. (https://www.linkedin.com/pulse/open-letter-julie-liegl-svp-salesforce-strategic-events-eliot-harper/). Well, Salesforce listened and this year it will be in Chicago. Connections is back and we want to ensure you have a place to “Connect”. 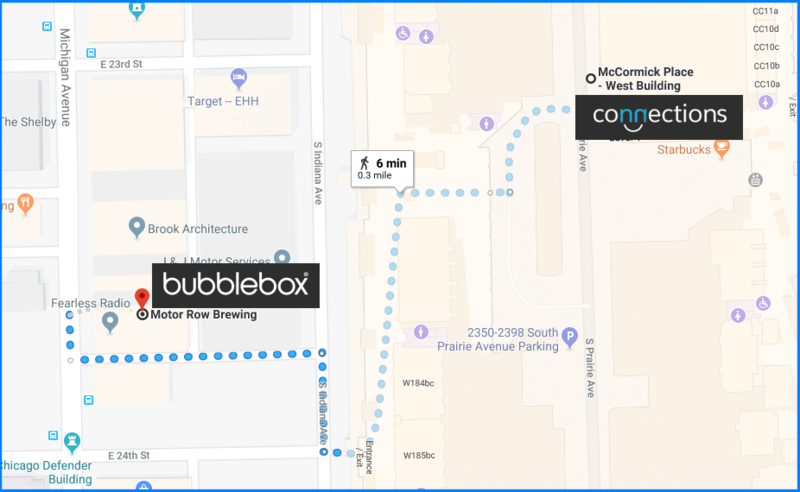 Bubblebox have taken over the Motor Row Brewery that is just a few steps from McCormick Place West - where all the sessions will be held. All are welcome to use the space. We’ll have complimentary drinks available - whether it’s coffee to get you roaring or a vino to take the edge off.